Have you ever felt like your money is out of whack? You make it to the end of the month and wonder where all your money went? Sometimes it feels like we are just trying to survive rather than using our money to reach our goals and dreams. My readers wanted an all in one handbook that allows them to be in control of their money and to focus on long-term financial goals while still managing the day-to-day financial responsibilities that so many of us struggle with. That's what the That Badass Money Handbook EBook is. Your all in one guide to managing your money. Identify your biggest long-term financial goals and priorities, then I will provide a comprehensive framework for accomplishing them. Discover a money mindset that will completely change the way you think about money. Gain an overview of your finances at a glance, so that you can plan out the big picture and avoid the struggle with my Money Organizer. Create good monthly financial habits, in order to move you closer to your financial goals. Establish a monthly cash flow budget so that you can tell your money where to go and not other way around. Plan your bills on a monthly schedule and automate them, so that you never have to worry about them again. Become more purposeful with your time by eliminating financial overwhelm and getting all of those details out of your head and into one place. Discover the surprising joy of managing your money well and make instant changes that will totally transform your life. Overcome you debt with a comprehensive plan to eliminate it without the stress. Learn how to save money like never before with a simple framework for building an emergency fund and building wealth for the long term. My name is David Shepherd and that is my lovely wife Krista in the picture on the right! I've always wanted to teach others about money and I've always had a passion for personal finance. That's why I went to the University of Cincinnati to get my Bachelor's degree in Finance and Accounting. I learned a lot about finances and investing. I loved it! I tried to find an all in one guide to manage my money and couldn't find one. That's why I created That Badass Money Handbook. My hope is, That Badass Money Handbook, will help you just as it has helped me to live a stress free and succesful financial life! Ready to reset your money habits and finally get your money back on track? 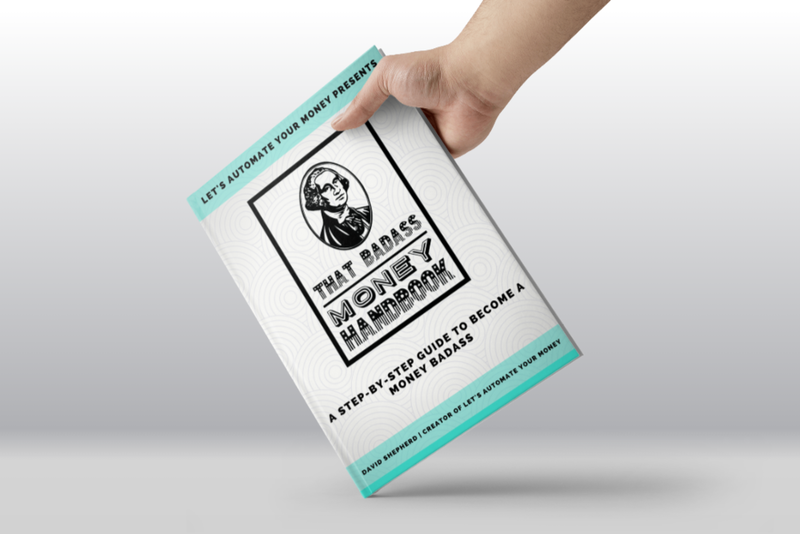 Through a combination of inspirational pages, workbooks, and action plans, That Badass Money Handbook will empower, enable, and inspire you to eliminate bad financial habits, create good money habits, and discover just how much you can do with your money. With it’s beautifully designed and colorful pages you will be inspired to take back control of your money and allow you to focus on long term financial goals while navigating the daily, weekly, and monthly financial habits you’ve been waiting for. Learning from Dave has been the easiest way for me to learn how to manage money. I was a single mom struggling to make ends meet and was living paycheck to paycheck, it sucked! Now since I have learned some tips from Dave my life has been much better and I don’t have to worry about being late on bills anymore. The bank app he recommended really helped me budget my money because the app does it for you! And this bank doesn’t charge you for overdrafts and other stupid fees. That itself has helped me out tremendously. IF THAT BADASS MONEY HANDBOOK DOESN'T HELP YOU, WE WILL RETURN YOUR MONEY. NO QUESTIONS ASKED. My finances are a total mess. I may be too far in debt to turn it around. Can this really help me turn it around? Yes. There is no hole to deep that you can't turn it around. All personal finances come down to a framework that works. That is what That Badass Money Handbook is. A framework that will help automate and simplify finances and most importantly, eliminate the stress. How long will I have access to That Badass Money Handbook? For life! You will get access to the entire course as long as you want it. It starts when you buy it and never ends. Take your time and complete the program on your schedule. In addition, you will get access to all updates to the course for FREE! I have big plans for That Badass Money Handbook and this is only version 1.0. More excited features to come! How will I receive That Badass Money Handbook? After purchasing the That Badass Money Handbook you will receive an email with instant access to a web portal that will allow you view or download That Badass Money Handbook and all bonuses. Plus you will have access to the portal for life!